Welcome to Pinkfresh Studio April Essentials Release Blog Hop! 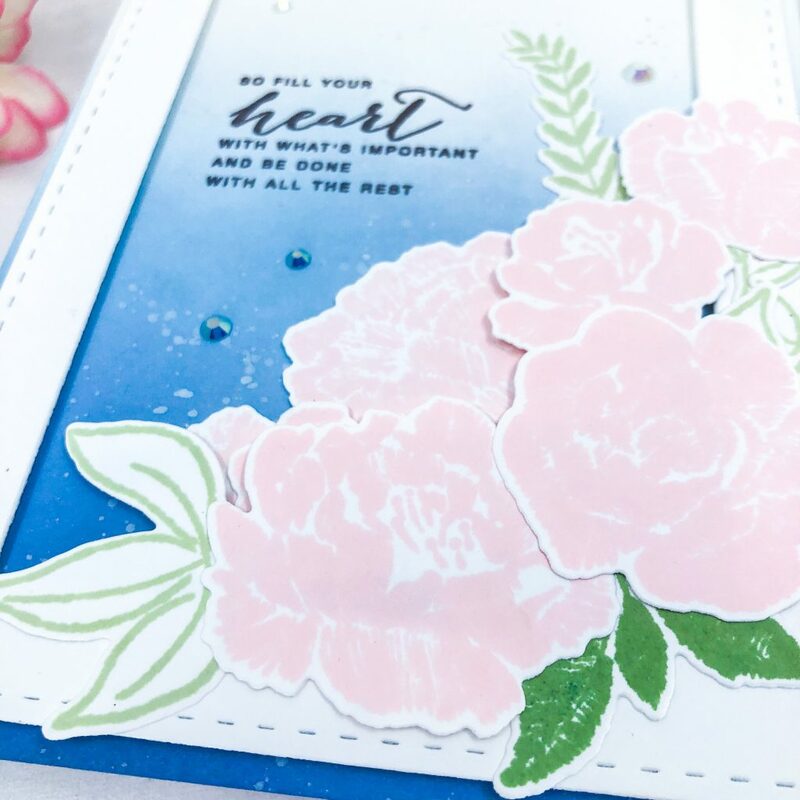 After having lots of stamps and floral dies from January Release, don’t you wish that you could have some basic dies to build the foundation of your cards? Now you have it! 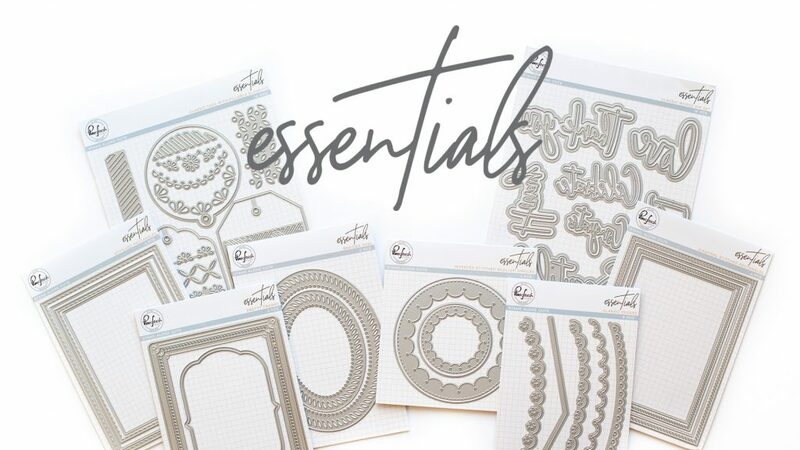 Whole bunch of Essential dies are here waiting for you! Today I am featuring the most basic and also the most important dies – Stitched Rectangles. They are simple and basic but somewhat unique to similar products on the market. It comes with 4 nested rectangle dies. Two of them are stitched and two are just simple rectangles. It gives us lots of potential to mix and match so we could achieve variety of shapes. The card I am showing you today is one of examples. To prep my background, I ink blended an A2 sized watercolor paper (Canson XL) using Tim Holtz Distress oxide ink in Tumbled Glass and Faded Jeans. Then I splattered some water and white paints to create some textures. I left it aside to dry. I overlapped two of stitched rectangle dies from Stitched Rectangles Dies to cut out my frame from a piece of 100lbs white card stock paper.Then I attached it over my prepped background using Foam strips. 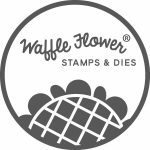 I stamped selected images from Embroidered Blossoms stamp set and die cut them using Matching Dies. Then I adhered all pieces to the lower right sided of my framed card using Multi Medium Matte and Foam squares. For my sentiment, I picked the one from Heart and Soul Stamp set and stamped it with Memento ink Rich Cocoa. I added a few jewels as embellishments to finish my today’s card. 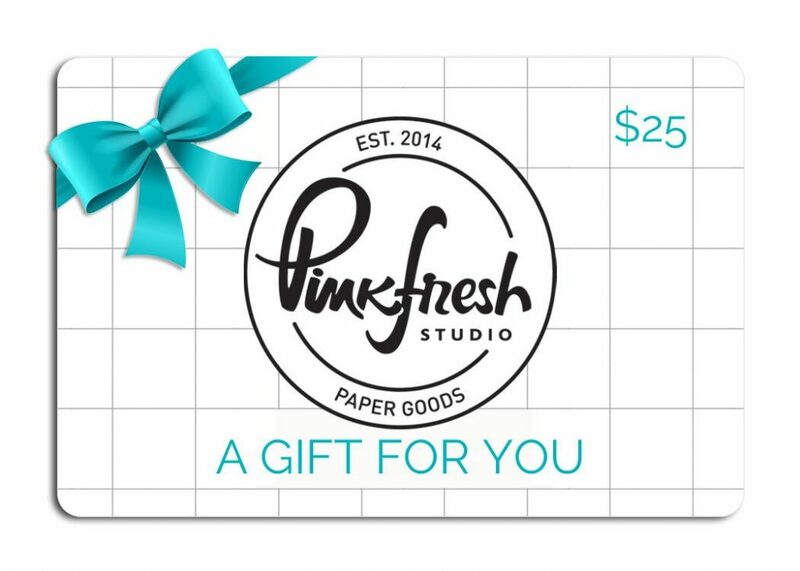 Pinkfresh Studio will be giving away the full April Essentials release on the Pinkfresh blog, and on our IG feed. I will be giving away a $25 gift card on my blog post too. the winners will be picked from the comments below. The winners will be picked and posted on Sunday, April 14th on our GIVEAWAY PAGE. You must check that page & claim their prize within 2 weeks. 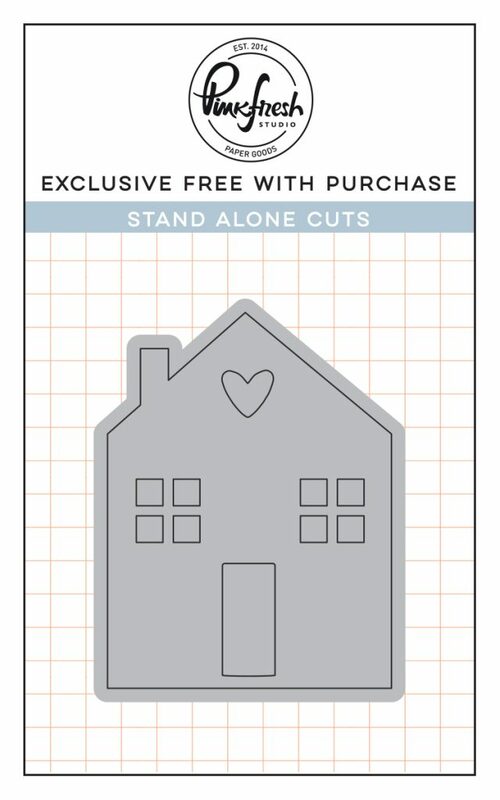 Free House die with any purchase. There is no code necessary, and the die will automatically load into your cart. 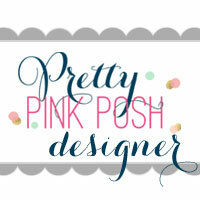 Pinkfresh will also be offering free/discounted shipping from April 8-11th on orders $50+. They must use the code APRESSFREESHIP50. Shipping is free in the USA, and $5.50 off for our International friends. Beautiful designs. Love the sentiment. Beautiful card! I love the pink flowers against the blue background0 they really pop! I really like the width of the stitched frame, too! SUCH a STUNNING frame and background! I love the flowers too! Great card, loved the color scheme! Gorgeous card and the sentiment is beautiful. Such a lovely card and subtle coloring! Beautiful card. The new release is a winner. This is exactly what I was thinking, Alix… so many ways to make these essentials shine! Beautiful card – gorgeous background is perfectly framed. Beautiful card. Such a classic die. Beautiful! The soft colours are so pretty, and I love the frame you created. I love all the supplies in this release. Such a gorgeous card. I love the sentiment! Such a pretty card. Love the stitched frame. It really enhances your focal point. 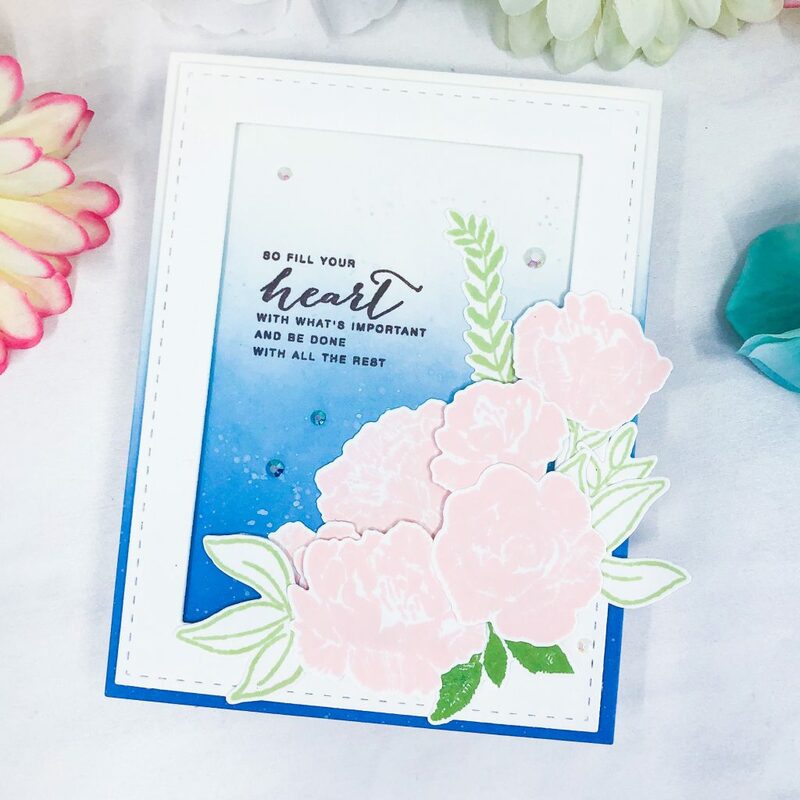 Love that gorgeous blue background you created it makes that card really pop! The stitching looks so great on the rectangular background. And the soft pink flowers look very pretty. These images could be used for Mothers Day, birthdays, hello, thank you….I like the flowers. Great job. Beautiful card! I love the frame. Alix I adore your card, so feminine and soft, just beautiful! Thanks so much for the inspiration! 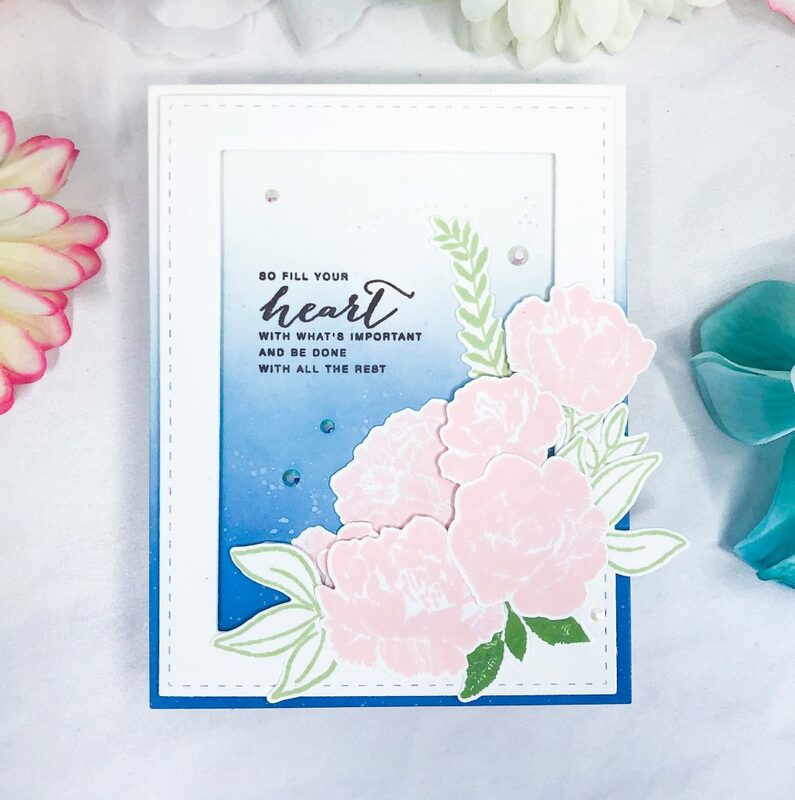 Gorgeous card with such soothing colors! !thanks for sharing!! Love how you created the frame and popped it off the page. Your card is beautiful. Very pretty! Love the sentiment. It seems basic but as someone who is always trying to get sizes precise for frames having the plane rectangle matched to the stitched one is brilliant ! Love the sentiment on your beautiful card. This new release is amazing. Gorgeous card. So much easier with the rectangle dies. Wow. Beautifully done card for the hop! You are so very talented! I love your work! Beautiful and worthy of imitation! Such a lovely card and I love the frame and the ink blending background. Great job! Beautiful card–I love the stitched frame! A beautiful card! Love the stitched frame. Such a beautiful card! The colors blend really well together and the stitched frame is a really nice addition! Love this die set!!! I love your card, color combination is wonderful. So pretty. I like the framing and the soft pink flowers. Love the blue background of your card. What a lovely job! Thanks for sharing your creativity! Beautiful framed bouquet, love the pink with the blue! Beautiful card. The color is so soft and pretty. LOVing the colors you chose on this. The background is amazing! I do like the options available with the plain rectangle shapes in the die set. Nice card-especially like the ombré background. So happy to see frame dies. Love using frames. You card is so pretty! Thanks pinkfresh!! Lovely card. After seeing your card, I had to revisit that die set. I love how it made the perfect little frame. Pretty in Pink! So fresh and summery. The card is so lovely! The frames are to die for!!! Pretty with nice pink florals. Subtle and chic. So pretty with the pink flowers. Love the frame and background. Thanks for sharing. Sweet card! Love the soft tone! Beautiful card! Loving those gorgeous blossoms and how your framed the whole card! 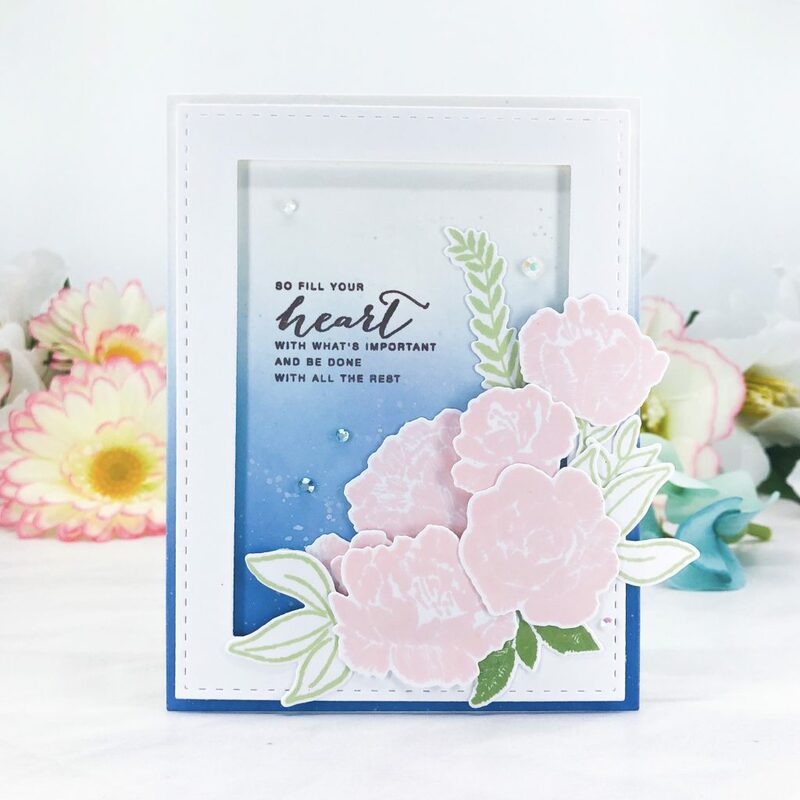 Love how your beautiful flowers enhanced the new frame die. Gorgeous card. What a fabulous release! And your card is lovely, Alix! Beautiful card. I love the sentiment!! Lovely pink on blue card, so soft and pretty for springtime. Love the softness of the colors. Background is so perfect for the frames. Really nice work Alix. I like how you used pink and blue and it didn’t look baby themed. Such a beautiful card!! I absolutely love that sentiment!! Very pretty! I like the background and frame. I agree Alix, the the new Rectangle stitched dies are so well thought out, making it simple ,not overbearing with too many dies that confuse me! Your card is lovely! A lovely card anyone would enjoy receiving! What pretty, soft colors you chose for your flowers, Alix. Thanks for sharing with us how you used the frames. Sometimes when there are lots of mix and match options I have a hard time visualizing them, so I like seeing how each designer uses products. Lovely card! Beautiful flowers, and nice effect with the frame! Love the soft colours of the card. The new release is fabulous. These dies are absolute must-haves in the stash. Oh so lovely card.Thanks for the great inspiration! Very pretty card. I love the stitched look of the frame. Love this large frame and the soft colors. So pretty! Love these essential tools! The colors in your card are just so pretty! Beautiful card and thanks for sharing. This is a beautiful design. These rectangular dies will be a must have.